This adventure is to some of Scotland's wildest landscapes is a great way to get a taste of the Fred.Olsen experience. Set sail from Liverpool for this adventure to some of Scotlands wildest landscapes is a great way to get a taste of the Fred.Olsen experience. 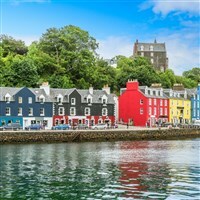 You can discover the splendid vistas of Loch Lomond, take in Tobermorys picturesque harbour, and travel back to pre-historic times on the Orkney Islands. A snapshot of Scotlands diverse scenery, this sailing is sure to delight.